If you're a card player and want a faster way to deposit real money to your online account, then prepaid credit card poker sites are the way forward. Designed to make the money transfer process from your US bank account as simple as possible, these secure gift debit cards are a must if you're a serious poker player. The top prepaid credit card poker site for April 2019 is Ignition Poker . What is Prepaid Credit Card Poker? Online poker in America can be a tricky business, especially when it comes to making deposits and withdrawals; however, this process has been made significantly easier in recent times thanks to the evolution of the prepaid credit gift cards. Operating in much the same way as standard credits and debit cards, these secure funding options are primarily supplied by Visa and MasterCard. To play prepaid credit card poker you simply need an approved prepaid MasterCard or one of the many prepaid Visa cards plus some real cash. To load your prepaid credit card with cash you can either visit the provider's website and transfer funds from your bank account or use a special prepaid Paypoint machine. Once you've loaded your card you can then visit one of our approved prepaid credit card poker sites and make a deposit. These deposits will usually be charge free and will complete instantly because the site doesn't need to verify whether or not you can afford the deposit (because it can only take funds that are available). Why are Prepaid Credit Card Poker Sites are Good for Your Bankroll? When you play online poker in the USA there will be a number of secure deposit options available to you, but in terms of protecting your finances there are few better than prepaid cards poker sites that accept Visa, MasterCard or American Express prepaid credit cards. No Bank Account Needed: A prepaid credit card isn't linked to your bank account which means you don't need to have a good credit rating in order to own one. 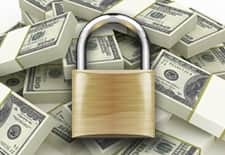 Moreover, it's not possible to access funds directly from your bank so there's little chance you'll run up any debt, compromise the security of your account or flag up that you enjoy playing online poker. No Debt: As we've mentioned, a prepaid Visa cards and MasterCard are not directly linked to your account. Any money on a card has to be put there by you, which means you'll only lose what's on the card. By using a standard credit or debit card you run the risk of depositing too much money from your bank account and putting yourself in financial trouble. However, when you play prepaid Visa poker you'll only be able to deposit the amount of money contained on the card. Secure: By not having a direct link to your card it means that your maximum liability is limited to the amount of real money you transfer to your prepaid credit card. For example, if you have $100 on the card then this cash is all you could lose if someone stole your details. This means that your bank account is secure and you won't lose any more than you can afford. Efficient: US online poker sites are always conscious of chargebacks and other issues when accepting credit and gift debit card deposits. For this reason it can be tricky to make a deposit using these methods. 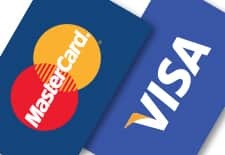 However, because poker sites that accept prepaid Visa and MasterCard options know that only money contained on the card can be used these problems don't exist. This makes the process a lot simpler for poker rooms and you. 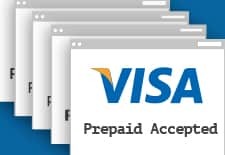 Through our network of partners we've put together a list of reputable poker sites that accept visa gift cards as well as prepaid credit cards. Each of these sites has been vetted by our team of experts and offers a safe and secure portal on which to play prepaid credit card poker. If you're a US poker player and want to play for real cash then you need an operator you can trust. Thankfully we've done all the legwork for you which means you simply have to check out our list of Visa gift card poker sites and gift prepaid credit card rooms and sign-up today. On top of being recognized as reputable, all of our poker rooms have a range of lucrative bonuses for players that make deposits using a prepaid credit card. Now that you have your prepaid credit card or voucher ready to go, the only thing left to do is to find a good poker room. These are non-recommended sites with long histories of bad practices that we list to show players what are some of the signs of a shady cardroom. Don’t join sites like these!